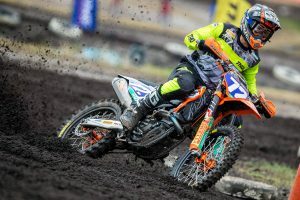 Fresh from having the rod removed from his femur, KTM Motocross Racing Team’s Kirk Gibbs is back in New Zealand building up a head of steam for a serious charge at the Australian MX Nationals. 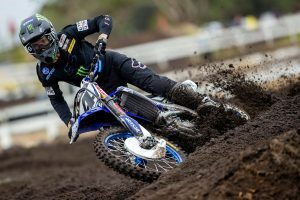 A fourth overall finish at the iconic Woodville Grand Prix on Sunday was the first step in the right direction for the 28-year-old and MotoOnline.com.au caught up with him to hear his thoughts on a range of subjects. 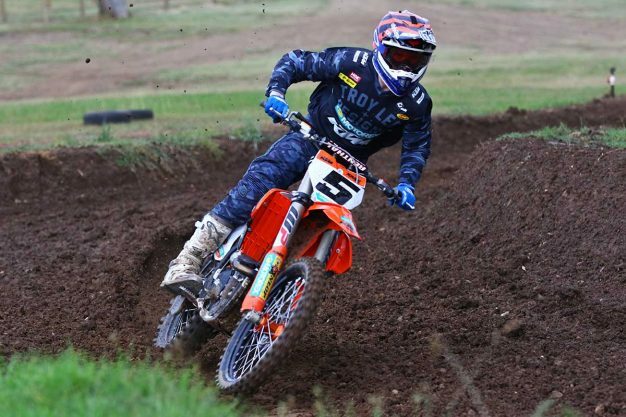 Woodville is always a great race and I love going back there. 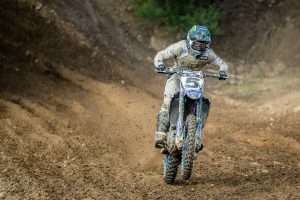 The track is really different to anything you’ll find in Australia – it has a mixture of fast and slow sections, but they rip it really deep and it gets rough and rutted. This year it was also about 35 degrees, so the ruts dried out and made it very technical. There’re so many spots that could trip you up and you had to stay on your toes the whole time. It was my first race since the Motocross of Nations and I struggled with arm-pump, which I kinda expected would happen. I was nervous and jittery as I hadn’t been in the racing scene for a little bit. I’ve only been back on the bike for three weeks or so and thought my speed was okay, but the day didn’t go to plan. I finished fourth in the MX1 class behind Cody Cooper, Hamish Harwood and Rhys Carter, then second in the feature race behind Kayne Lamont. I took a break from racing in New Zealand the past two years, not by choice, but because of injuries. 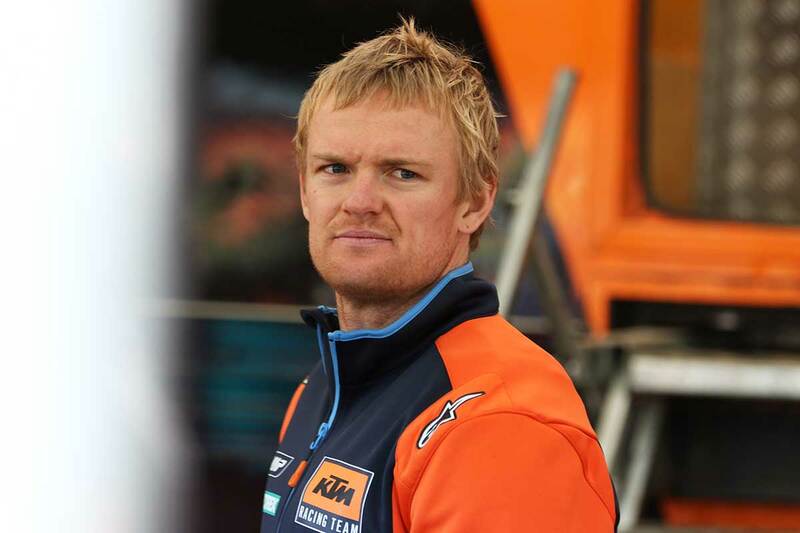 I love going back – everyone is so welcoming and the CML KTM Racing Team really helps us out. It works in well with my Australian team, I have my mechanic here working hard and I’ve pretty much got my whole bike here. Doing these races helps a lot, I feel. The tracks are rough and gnarly and the Kiwi boys, Harwood, Cooper, Lamont and Carter are moving hard – there aren’t just one or two guys going fast, the top five are all pushing the boundaries. That’ll definitely be good for me and I’ll squeeze some races in at home once the Kiwi race season is finished too. I personally feel that I’m way ahead of where I was the past two years and the last time I came to New Zealand I won the 2015 MX Nationals, so I only hope I can repeat that. I didn’t race supercross last year, so I got to train hard for the MXoN, then came back and kept riding and training for a couple of weeks before I had surgery. I had the rod taken out of my femur on November 15th and was on the couch for several days feeling pretty sore. Most of the swelling went down then and I could walk around, then after two weeks I could start stationary cycling to try and not lose too much muscle. Everything’s sped up from there. I saw the doctor before Christmas and he was really impressed with my progress, so that was pretty encouraging. All in all though, it’s way better to get the rod out rather than keep it in – if you crash and bend the rod, the bone shatters around it and makes it so much more dangerous and really complicated to remove. It’s one of those things where you just have to get it out and try and recover as quickly as possible. It should make things very interesting, especially with the two double-header rounds. Say if you crash on Saturday and sustain an injury, you don’t just have to get through the day, you’ll have to recover overnight as best you can and try and race again the next day, without the luxury of having a week in between rounds. It’ll be harder on the privateers too who won’t be used to racing two rounds on consecutive days. I think the new calendar will be a lot tougher and really show who puts in the work. It’ll be good to mix it up with the new rounds too, to keep things fresh and different. We haven’t raced at Maffra (Newry) in at least 10 years and Maitland will be interesting to see how they build a new track. We raced at Gladstone back in 2014 and I won there, so I’m looking forward to that round. It’s tight in sections, but I loved the deep ruts and felt like the track suited me quite well. We’re going to lose Todd Waters to the US, but we have a heap of new, young kids coming through. There’ll be the older guys of Metty [Brett Metcalfe], myself and Dean Ferris against the young talent of my new team-mate Luke Clout, Caleb Ward and Mitch Evans, so it’ll be tough and I believe everyone wants to prove a point. Dean will have a target on his back after an amazing 2017 and my aim is to be right there ready to battle every weekend and have a red hot crack at the title. Losing the title to Dean by six points in 2016 was devastating, but I think 2017 hurt more because Dean wiped us out. I really want to make amends this year.